Dhoni’s lightning quick glovework gave India their first wicket. MS Dhoni is 37-years-old and is nearing the end of his illustrious career, which started way back in 2004 against Bangladesh. However, he can still give the youngsters a run for their money. His power-hitting prowess is on the wane, but as far as his agility is concerned, it hasn’t taken much of a dip. He runs fast between the wickets and his intensity on the cricket pitch hardly dips. He can’t be called the most agile wicketkeepers doing the rounds at this point of time, but his reflex-action behind the stumps remains to be an asset for the Men in Blue. His stupendous glovework was again on display at the Seddon Park in Hamilton during India’s third T20I against New Zealand. The visiting team’s decision to bowl first backfired in the initial stages. Colin Munro and Tim Seifert took the Black Caps off to a great start courtesy of a stand of 80 runs from 46 deliveries. Seifert, the Man of the Match in the Wellington T20I, looked ominous after scoring 43 runs from 25 balls with three boundaries and as many sixes into the stands. However, his knock was cut short by chinaman bowler Kuldeep Yadav, who was playing his first game. Yadav bowled a delivery that spun sharply past Seifert’s bat and the latter was completely beaten. Dhoni didn’t make any mistake whatsoever and he collected the ball cleanly. Subsequently, the 37-year-young MSD took the bails off in a flash. However, the decision went upstairs to the third umpire in Chris Brown, who had a close look at it for quite some time. 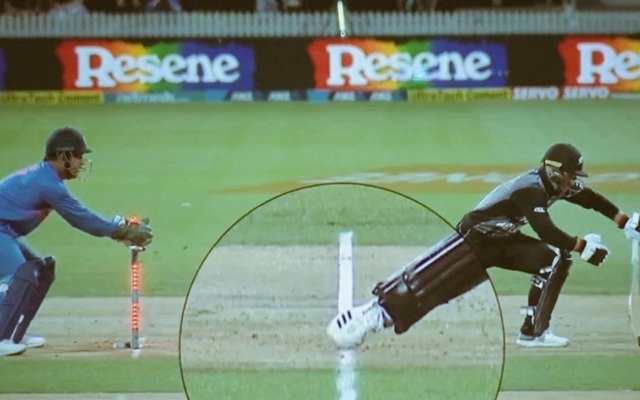 Replays showed that the batsman’s foot was on the line, yet the TV umpire zoomed in and cross-checked it in order to ensure that the correct decision was made. The decision went in India’s favour and Dhoni’s lightning quick glovework gave India their first wicket. The stumping was recorded at an incredible 0.099 seconds. Effecting stumpings is bread and butter for Dhoni. Isn’t it!